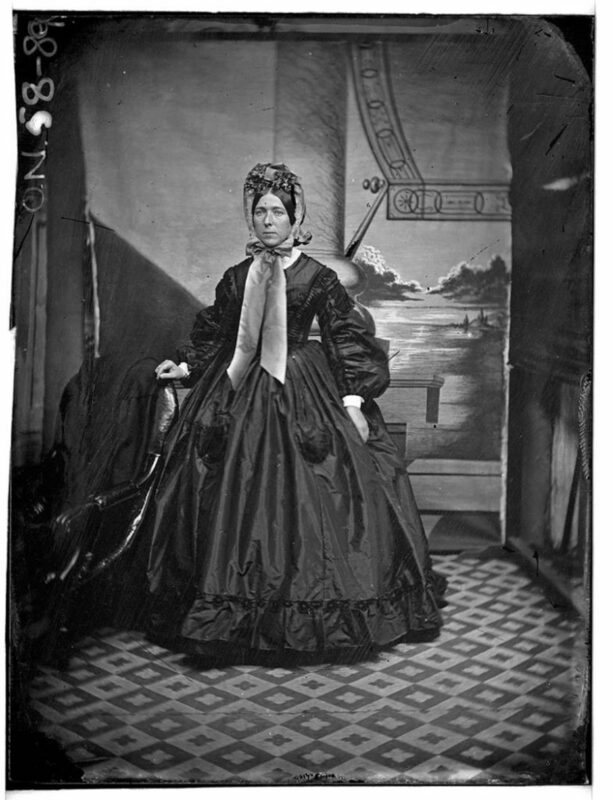 This full-length portrait shows a fashionably-dressed young woman, aged in her mid-20s though her identity is unrecorded. Evidence of prolonged exposure to the sun (clearly seen in the tan line across the subject’s brow) may indicate that she is a recently arrived immigrant or has travelled in to town from the interior of the colony. She is posed standing next to a leather-upholstered armchair, set on a geometrically-patterned floor cloth, in front of a photographer’s backdrop, depicting a balcony scene with a grand column, decorative awning and coastal view stretching to the horizon behind her. The negative also captures part of the interior of the Parramatta studio of native-born photographer Henry William Burgin II, though much of this detail would have been cropped out of the final print. The woman wears a plain, dark [silk] taffeta day dress which looks to be brand new, exhibiting all the latest fashionable features. The high-necked bodice is worn with a narrow, white collar above a plain corsage, with bands of ruched self-fabric trim forming a V-shape rising up from the round waist over to the sloping, dropped shoulder line, and epaulettes fitted at the upper arm above full ‘bishop’ sleeves gathered into a centre front seam and worn with narrow white cuffs. The full, bell-shaped skirt is pleated into the waist, above a pair of ornamental patch pockets, and has a moderately full flounce inserted above the hem, the seam trimmed with dark [velvet] flowers. Her dark, centre-parted hair is covered by a ‘spoon’ bonnet. The bonnet’s brim, rising vertically above her forehead in a spoon-shaped curve and narrowing to sit close to the ears, is filled with a bouquet of fabric flowers and slopes behind to a very small crown which is edged with a ‘bavolet’ flounce at its base at the back of the neck. The bonnet strings (or ribbons) are tied under her chin, the handsome ribbon streamers are left long and wide to show off their fashionable ‘ombre’ (shading). Four significant facts seriously affected fashions of the 1860s and thereafter. Firstly the sewing machine had been invented, secondly synthetic dyes would soon make a wide array of more intense colours available, and thirdly – from this time and into the future – clothing trends would be increasingly led by couture design. Fourthly, by 1867, the crinoline-domed skirt silhouette had developed a flattened front which began to show a dramatic leaning toward the back of the garment. By this time, a woman in middle class circles might buy a dress ready-made, or buy the bodice ready-made (which was more complicated to fit and construct) with a length of the same fabric to make the skirt herself. She, or a dressmaker, might also use one of the paper patterns distributed free by fashion magazines, such as The World of Fashion, from 1850. Bonnets also became shallower and set further back on the head at this time. By the 1850s, Parramatta was the fifth largest town in New South Wales, vigorously promoting itself as an alternate shopping destination to Sydney and offering a wide range of skilled tradespeople, goods and retail services. After the discovery of gold to the west of the Blue Mountains, the town lay at the crossroads of the colonial transport networks, and directly in the path of the frantic movement of people and merchandise between the coast and outlying mining and pastoral settlements. Henry William Burgin II (1830-1914) was born in Parramatta, NSW, the eldest of three children of Henry William Burgin and Mary (née Gowen). By 1853, H.W. Burgin II was established as an ‘ophthalmic optician’ in at 183 Church Street North. He also operated a business as a jeweller, watch and clockmaker from the same Church Street premises, before taking up the photography in about 1860. Burgin married Grace E. Curtis at the Parramatta Presbyterian Church on 6th February 1851, and the couple had nine children, before Grace’s death in 1868. Burgin then married Ann Sanday in 1870. With no advertisements known to indicate the extent of their photographic practice, two surviving collections of prints and negatives document the Burgins’ output and record the array of poses and props they used to create the genteel portrait setting recorded in their suburban studio, marking their work as clearly as any photographer’s stamp. The collection of wet-plate negatives (ON 58) and cdv portraits (PXA 1036) mainly by Burgin and held in the Mitchell Library, feature studio portraits and show people, many local Parramatta residents, either seated or standing beside furniture props. Different examples of the photographer’s stamps of the Burgins (father and son) are also represented along with many images that do not bear a photographer’s stamp but can also be determined as having originated from Burgin’s studio by their backdrops and studio furniture. Although photography occupied only part of the daily business of Henry Burgin II, he may well have been influenced by the work of itinerant photographers passing through Parramatta, such as Beaufoy Merlin. Burgin also appears to have continued using his old camera into the 1890s, long past his studio years, to record important local events. In 1859 the Sydney press heralded the arrival of carte de visite photography in the colony, proclaiming: ‘truly this is producing portraits for the million [sic].’ Cartes de visite were small photographs, printed from a glass negative onto paper, and pasted onto a slightly larger piece of card. These photographs were cheap to produce and copies could be printed by the dozen from the same negative. Unlike their photographic predecessors, the daguerreotype and ambrotype, no glass was used in the final product, making cartes light and easy to post. For the first time in history, ordinary people could afford to have their portrait taken, and have copies made to send to anyone living within reach by mail.